So the day has finally come. My last radiation treatment. I almost can’t believe it. 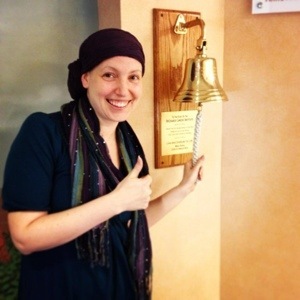 After a 7 month journey, I got to ring my final bell, symbolizing the close to this chapter of my story! Just an intense overwhelming feeling of joy. And what better way to celebrate this accomplishment then to have my parents and some of my close friends there to witness. As I stood there ringing the bell I thought back to when this all started. How incredibly scared I felt the day I received my diagnosis. Thinking why God is this happening to me. Why can’t we catch a break? What are we going to do? How will we ever get through this? Sometimes we just have to realize that no matter what, we will be ok. We are right where we are supposed to be. The moment I stopped crying and got all the self pity out of my system, I knew I was going to be just fine. Worry wasn’t going to help. I had to focus and stay positive in order to get through this battle. So everything negative had NO PLACE in my life! So here we are at the end. I couldn’t have come this far without all my friends and family. My support system is absolutely amazing! So I am dedicating this final ringing of the bell to all of you!!! I love you all so much. And truly blessed to have all of you in my life! Congratulations! This is a day you will never forget. Ring that bell, girl!